It’s hard for me to find something for my mother in law for Valentine’s Day. Each year we like to do something special for her because she does a lot for us all year long. We want to show her how much we love and appreciate her. Super Jeweler is full of affordable jewelry that does just that. For Review I received the Blue Topaz Heart Shaped Pendant (pictured above). 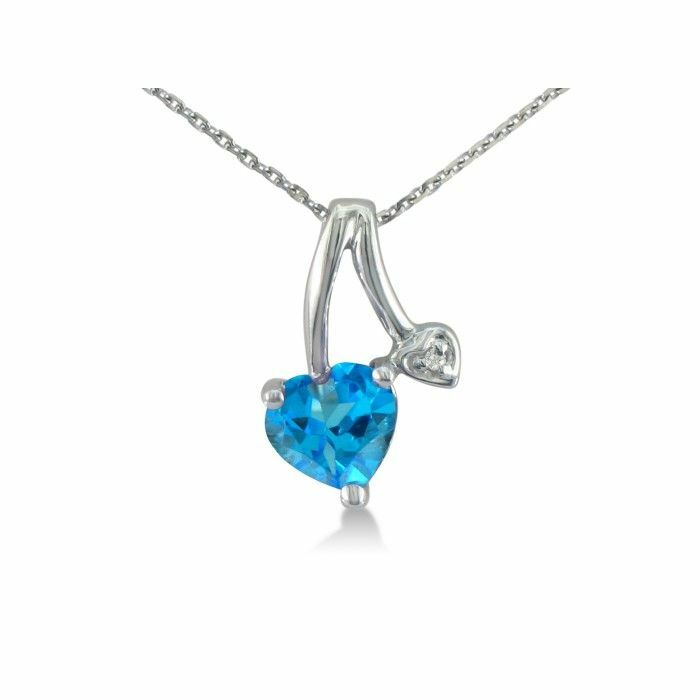 This 10k white gold, heart shaped blue topaz and diamond pendant has a total gem weight of 1/2ct. Diamond content is .005ct in I/J color and I2 clarity. It even comes with a complementary 18-inch chain. The chain is delicate and goes beautifully with an open necked or scoop neck shirt. Looking for an engagement ring for the special girl in your life? Super Jeweler carries those too. Showing her you love her has never been easier with this 1 2/3 ct Oval Halo Diamond Engagement Ring, Crafted in 14 Karat White Gold. This is a classically beautiful diamond engagement ring. This ring boasts a 1 carat oval shaped center surrounded by a halo of diamonds. The ring has a total diamond weight of 1.64 carats. There are 65 diamonds total in I/J color and I1/I2 clarity. The ring is crafted in solid 14 karat white gold and is available in ring sizes 4-9. I also love the 1/2ct Diamond Hoop Earrings in Sterling Silver. 1/2 carat diamond stud earrings. I love the 5ct Cushion Cut Mystic Topaz and Diamond Pendant in 10k White Gold….stunning! 🙂 Thank you. I would like to have the 1/2ct Diamond Stud Earrings in Platinum. I like the Gold Heart Bangle Bracelet. 1ct Diamond Pendant in 14k White Gold – beautiful! I would love the 4ct Created Pink Sapphire and Diamond Heart Pendant, Sterling Silver. I love the 13 Carat Blue Topaz and Diamond Bracelet in Sterling Silver. I like the 1/4ct Oval Opal And Diamond Pendant in 14k White Gold. I would LOVE the 9ct Classic Diamond Tennis Bracelet in 14k Yellow Gold. Its so pretty! I would love to have the 1/2ct Curve Style Journey Diamond Pendant in 14k White Gold, G/H SI3. In the gemstones section they have turquoise, and I personally like this item: Vintage Inspired Turquoise and Antiqued Silver Tone Beaded Necklace. I would love to have the 4.86ct Emerald and Diamond Bracelet in 14k White Gold. I love the one carat round diamond stud earrings. So beautiful! I would also like the 1/2ct Diamond Stud Earrings in 14k White Gold. Featured on Dr. Phil. The 1ct Diamond Pendant in 14k White Gold is very pretty. I would love to have the 1 1/2ct Diamond Stud Earrings in 14k White Gold, G/H, SI2/SI3. Mother and Child Diamond Heart Pendant in 10k White Gold. I love the Unique 1ct Oval Diamond Bracelet. It’s so pretty. I would love the 1ct Diamond Pendant in 14k White Gold! I like the Dangle Style Ruby and Diamond Pendant in 10k White Gold for my wife. I would like the Bypass Diamond Promise Ring in 10k Yellow Gold. I love the Ribbit! Blue Topaz and Diamond Frog Pendant in 10k White Gold. I would love to have the Heart bangle bracelet in gold. I would love a diamond solitaire necklace !! The 1ct. diamond stud earrings in white gold would look fantastic on my lady. I like the 9ct. classic diamond tennis bracelet in 14ct. white gold. The 9ctin white gold diamond tennis bracelet is a WINNER. The 1.50 Carat Princess Cut Diamond Solitaire Engagement Ring In 14 Karat White Gold is beautiful! I would love to give the 1/2ct Diamond Stud Earrings in Platinum to my daughter for her birthday. Black and White Diamond Heart Pendant in Sterling Silver! I like the heart shaped key necklace. I’d love to have the 1/2ct Diamond Inside-Out Hoop Earrings, Sterling Silver, 1 3/4 Inches! The Leaf Style Black Diamond Pendent. 85ct Black and White Diamond Wide Band Ring is my favorite. I love the Black Diamond Dog Earrings! I would love the 1 carat diamond pendant – a girl can dream! I like the 1 Carat Green Amethyst and Engraved Diamond Ring. I also like the 1ct Three Diamond Drop Style Diamond Earrings In 14k Yellow Gold. I think the “Super Cute Turtle Shaped Freshwater Pearl Earrings” are adorable and super cute. I would love to be able to give these to my niece for her birthday, she had her ears pierced a few weeks ago. I Love The 1/2ct Diamond Stud Earrings In Platinum. I would like the Black Diamond Dog Pendant in Sterling Silver. It’s really cute. I like the 3/4 garnet and diamont ring in silver. I would love to have the 11/2ct oval Aquamarine & Diamond Ring in 10K White Gold. Would love to have the 1 ct diamond pendant. I would love the classic diamond earrings! Beautiful! I like the 1.25 Carat Round Cut Diamond Solitaire Engagement Ring. Well, this wouldn’t be for me, it would be for my girlfriend, so I don’t know what else. I love the 2ct Diamond Bridal Set With 3/4ct Center Diamond in 14k White Gold. Very beautiful! I would love to have the Split Band 3ct Oval Blue Topaz and Diamond Ring in 14k White Gold. I would to have the 3/4ct Marquise Emerald and Diamond Ring in 10k White Gold. The marquise shape is my absolute favorite for rings! I’d love to have the 2ct Round Setting Diamond Tennis Bracelet in 10k White Gold! This is something my girl would totally Love. I love the Split Band 3ct Oval Blue Topaz and Diamond Ring in 14k White Gold. I would lovee the 14 Carat Emerald and Diamond Bracelet in Sterling Silver. Really gorgeous. I would love to have that owl pendant it is sooo unique!! I like the Adorable Swarovski Elements Owl Necklace. I like the 1/4ct Diamond Hoop Earrings in Sterling Silver. I liked the Owl bracelet!!! The item that I would love to have is the 1ct Diamond Pendant in 14k White Gold. I would love to have the 1ct Bold 3-Row Diamond Bracelet Crafted in Sterling Silver. the rose tone hoop earrings! 1ct Diamond Pendant in 14k White Gold looks nice. I would love the 1 1/3ct Oval Mystic Topaz and Diamond Ring in 14k White Gold!! I like the Stainless Steel Gothic Rhinestone Cross Dog Tag. I like the 1/2ct Diamond Cross Pendant in 10k White Gold. I would love to have the 1/2ct. Diamond stud Earrings in 14k White Gold. I like the 2 1/2ct Cushion Cut Pink Topaz and Diamond Pendant in 10k White Gold. i love the 1/2 carat diamond cross necklace in 10k yellow gold! Men’s Stainless Steel Gothic Bracelet, 8 Inches is what I would “love” to have if I was in the market for some cheap trashy jewelry. I’d like the 3/4ct Tanzanite And Diamond Ring In Sterling Silver. I love the 1/4 carat blue diamond pendant in 14k whit3e gold. I like the .03ct Diamond Heart Pendant in Sterling Silver. Thanks for having this contest. These are really pretty earrings! I like the Tanzanite and Diamond Tennis Bracelet in 10k White Gold. I like the 1/4ct Oval Opal And Diamond Filagree Pendant in 14k Yellow Gold. the 2ct Round Setting Diamond Tennis Bracelet in 10k White Gold.